The new Royal Birmingham Conservatoire delivers state of the art, world class instrumental music teaching, rehearsal, performance and recording facilities. 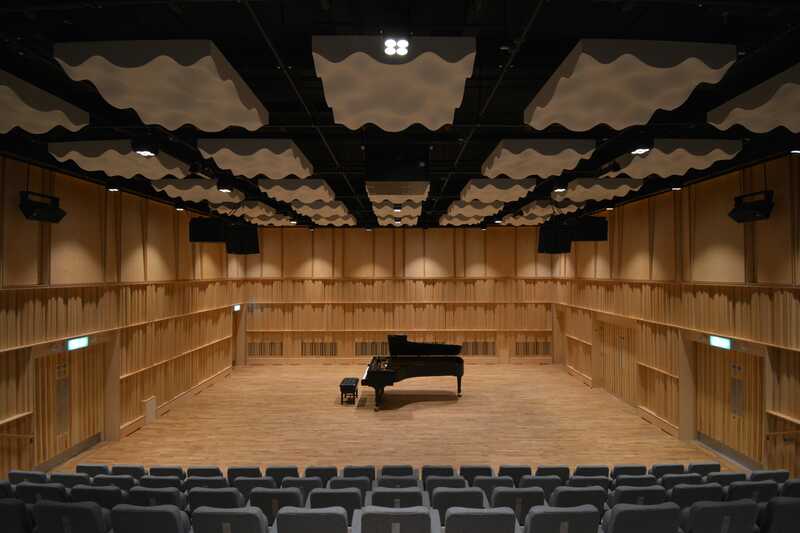 Designed to elevate Birmingham City University’s musical educational offering, the aim was for a facility to truly inspire the next generation of the world’s finest Classical and Jazz musicians. Client expectations were high, so this unique and innovative building demanded a ‘tour de force’ in acoustic design, including very high levels of airborne and structure borne sound insulation, varied and exacting room acoustic conditions and ultra-low building services noise. Located on a small parcel of land, adjacent to a dual carriageway, with future proposals for a new tram line, challenges were evident from the outset. During the tendering process the consultants proposed that, in the interests of the controlling project budget and mitigating design risk, and also in view of the short construction programme for this complex building, they should be retained as overall ‘project acoustician’ representing both client and contractor interests. This helped expedite both the decision making process and the resolution of issues on site, and allowed ultimate control of the acoustic quality of the completed building. This pragmatic agreement between client and contractor was key to the successful completion of the building. The judges recognised that high profile projects inevitably stand out but this is offset by the high expectations of this project, the existence of multiple venues within the building and a contractual arrangement allowing the acoustician to act for the project as a whole, which all make this unusual. They were pleased to see testimonials from users and that the facilities had been booked for both TV and Radio broadcasts.